I hate Cam Newton – all his swagger, his dancing, his prancing, his preening. I also seriously hate Russell Wilson and his low-key, nice-guy, super-boring style. And Doug Williams is the worst of the bunch, sharing something in common with his African-American quarterbacking brethren that I absolutely loathe. I’m talking, of course, about their collective ability to send the Denver Broncos home for the season with their horsey tails tucked between their legs. Cam hasn’t accomplished the task … yet. But the other two decisively throttled my hometown team in the Super Bowl, and for that they have earned my undying enmity. Newton has it for brashly standing in Peyton’s path. Yes, they all do happen to be black, but that’s not why I hate their guts, which are presumably the same color as mine. I also hate Phil Simms and Joe Montana – two white guys who utterly humiliated the Broncos in the big game. Sorry, I’m ambivalent on Roger Staubach because he beat the Broncos in their first Super Bowl in 1978, which was before my time in Colorado. In fact, my family moved here the following year in 1979 from Washington, D.C., so I was still a bit of a Redskins fan even when Williams and out-of-nowhere running back Timmy Smith absolutely trampled the Broncos in John Elway’s second straight disastrous Super Bowl start. Williams was the first African-American quarterback to start in and subsequently win a Super Bowl trophy and the game’s MVP award. He did it in a quiet, dignified way that won the approval of the NFL’s establishment and essentially makes him the anti-Cam. But I’m a Bronco fan, so I despise Williams nonetheless. I actually love Cam’s style against every other team in the league, especially the Seattle Seahawks and their whining 12th-man fans. But if he does it to the Broncos on Sunday, I will hate that style and forever place Cam on my short list of QBs I love to hate. Don’t worry, Cam, you’ll never surpass the guy at that top of that list, the whitest, most establishment-friendly field general of all time, New England’s Tom Brady. If he played for the Broncos I’d love him, but since he helms our archrivals, he’s a cheater and a Trump-lover. Peyton Manning, when he was a Colt, was high on my hate list because he always knocked Denver out of the playoffs. Had HGH allegations arisen then, I would have screamed from the highest heights to have him kicked out of the league and I would have personally nominated Al Jazeera for the Pulitzer. But now that Peyton (derided by radio hack Jim Rome for his pink forehead … ain’t that racist, Redskins’ fans?) is a member of the Broncos, I forgive him all sins real or imagined. Though it’s been banned by the NFL since the early 90s, the league didn’t start testing for HGH until 2014, so if Peyton or his wife received it in the mail in 2011, who cares? Good luck proving he used it. Brady, on the other hand, definitely deflated footballs to his benefit, and the Patriots systematically cheated their way to four Super Bowl titles by taping opponents’ practices and knowing their defensive signals in advance, and the league helped them cover it all up. That’s just the way it is, so get used to it, Boston, just like you have to live with that losing record in Denver and Peyton’s 3-1 record in AFC Championship games against Brady and Eli Manning’s 2-0 Super Bowl mark against him. Without the Manning brothers, Brady could have nine Super Bowl rings. But he’s not great, because he’s not a Bronco, and he clearly cheated. 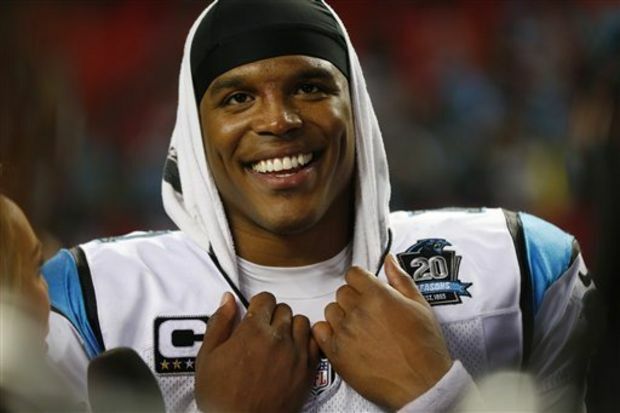 Now, back to Cam Newton’s blackness and White America’s uncomfortableness with the way he carries himself. I repeat, I will hate it if he does it to Denver, but otherwise I love it and love that he’s changing the paradigm for how black athletes are supposed to behave. If you hate his style for any other reason than he’s opposing your team and likely to do some serious damage, then you need to reassess your attitudes in this era of Black Lives Matter and documented police abuses in African-American communities. You also need to seriously consider why the Academy of Motion Picture Arts & Sciences could find no black actors to nominate for Academy Awards this year in the wake of justified #OscarSoWhite outrage last year. And you should go see “The Birth of a Nation,” which enflamed with passion lily-white crowds in Park City at the recent Sundance Film Festival. I caught the “The Birth of a Nation,” which The New York Times is already touting for a possible 2017 Oscar nomination, at Sundance on Sunday. Directed, written and starring Nate Parker as Virginia slave-revolt leader Nat Turner, the film won the Sundance grand jury prize for narrative film and was voted best movie by festival audiences. “An issue film succeeds when it touches people,” Parker reportedly said at the festival. “I’ve seen that people are open to change.” Fox Searchlight last week paid $17.5 million for the distribution rights to Parker’s powerful film – a Sundance festival record. If you don’t like Cam, go see the film and question your own attitudes. Wonder also if you’d be quite so critical of President Barack Obama’s policies if he wasn’t the nation’s first African-American president. And search your soul a little about how the economic deck is stacked in favor of White America even to this day. Ask yourself if inner-city segregation isn’t in many ways just an extension of plantation life in the 1830s. And finally, ask yourself if maybe Newton doesn’t go far enough in asserting himself as a successful African-American man – one who can serve to inspire real change the way Obama has in the White House.